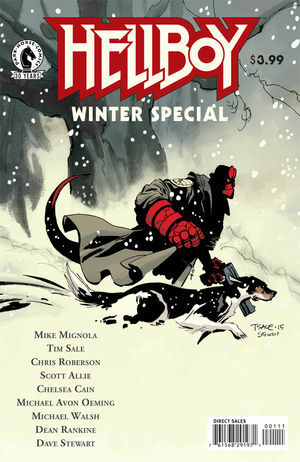 I have to admit I am woefully behind in Hellboy. I go through binges of reading it to catch up and then get left behind again. I have my mind set on getting back on track. However, I always read the mini series and one offs as they are so non committal. This winter special possesses the talent of Mike Mignola, Chris Roberson, Chelsea Cain, Scott Allie, and artists Michael Walsh, Michael Avon Oeming, and Tim Sale. The issue is 36 pages long and has a couple sweet variant covers although I suspect most people will go for Mignola's cover. There are four stories. One about ghoulist monsters who possess snowmen that kinda got on my nerves. It takes place in Liz's adolescence and she's basically the brunt of much jokes... you know because teenage girls are hormonal and unreasonable. I know teenagers can be erratic and unreasonable but they are not insane.... Anyway. The story I enjoyed the most was the the one which took place in 1953. You may remember the recent series of Hellboy under the title 1953. For a special, I kind of thought the issue would be a bit bigger. 36 pages just didn't seem all the long to me because I've been reading such huge Vertigo issues lately. Well, I guess that must be it. Anyway, cute little stories with some humor and the awesome monsters. I especially like young Hellboy. :D You can get your copy tomorrow! The busy hands of Cullen Bunn (Deadpool Kills the Marvel Universe, Hellbreak, The Sixth Gun) have produced another creepy story. Blood Feud is put out by Oni Press and already in it's third issue. I have been a fan of Cullen for sometime and I always check out his new work. I didn't even realize at first that this was a vampire story. It harbors the creepiness of Harrow County while taking place in a modern setting with perhaps not the most modern people. Small town Spider Creek is home to a horrible blood feud that has been ongoing for as long as anyone in the town can remember. Two families at war, the Stubbs and the Whatelys. It's the later who harbor some dark secrets which are rumored to be more than a flirtation with dark powers. As far as I can tell, this comic started out a novella made available for download by Bunn on his website. For the comic book, Bunn has joined forced with artist Drew Moss and color artist Nick Filardi. I'm not completely in love with the artwork but I certainly don't hate it. There are a couple wonky panels scattered throughout the first three issues. One particularly rushed looking panel where the alignment of a characters body looks a little dangerous.. if someone was to look that off-centered from ones hips.. they might need surgery. The artist takes a more minimalistic approach to each panel which is something I've always admired in artists. Although you can certainly see me gush on a busy panel here and there, the majority of artists I enjoy are like myself and go for subtlety. 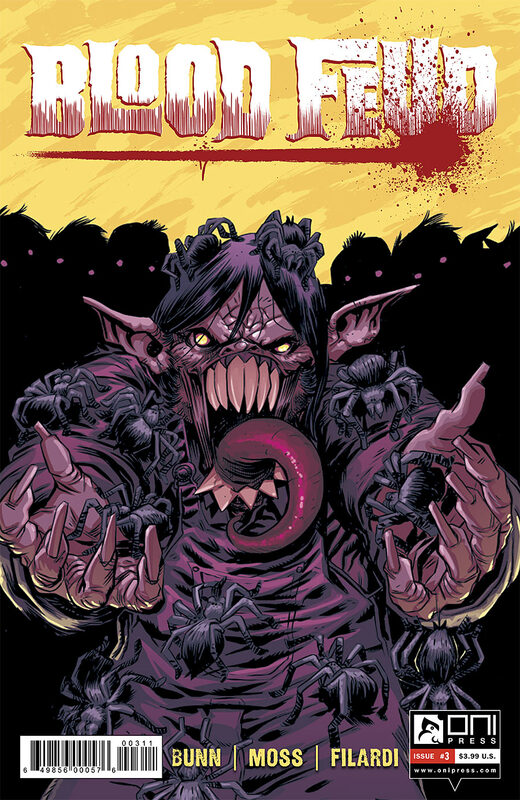 We've only got two issues left and I can't say what exactly is going to go down now that the vampires clan is uncovered and been made extremely upset...guess you'll just have to check it out. Get your copy of issues #3 this Wednesday! The story thus far follows a teenager who suspects his parents have been lying to him his entire life. In issue one, we learn that the entire family was put into witness protection...but why? Well our hero Teddy isn't going to continue on through life believing everything he's told. He embarks on a mission around the neighborhood trying to find out who broke into their house, and just what is really going on. He simply can't believe anything his parents tell him. After all, he's been lied to his entire life. 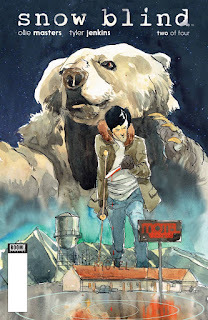 As far as a story goes, you kinda get the feeling at first that the plot is rather run of the mill but Masters has some delightful surprises in store which make this no ordinary mystery. Teddy himself is a very realistic character in that he makes mistakes just like any teenager would. He doesn't always consider his actions and as his emotions heighten, his impulse control drops and he simple reacts. Reminds me of what I felt like when I was younger.. crazy. The art of course is on point. I'm a big fan of Jenkins' work so I just eat up whatever he throws out to us fans. I really like the soft watercolor in this book where as recent mini series Neverboy was not colored by Jenkins. At any rate, very excited to see the next chapter! Keep your eyes tuned to the Boom Releases next month to get issue 3! You can read Snow Blind TODAY. As soon as your local shop opens for business. It's absolutely no secret that Junji Ito is my favorite manga artist & writer. I mean, it's insane to be able to say you have a favorite manga artist OR writer and the fact that I am CERTAIN given all the manga I've consumed and that both those qualities sit within one person... That's amazing. He's amazing. Anyway, I recently acquired my own copy of Cat Diary (which I had hoped to achieve on release but was unable to). This is the horror author's first complete stab at humor. Honestly, I wasn't sure how I'd enjoy the book. The story starts with Junji, his wife affectionately referring to him as J, buying a new home! To his absolute horror his wife intends to bring her family cat into the new home. As if that weren't enough, she plans to adopt a second cat! The story is told with a great deal of humor and drawn very much like he's drawn any other manga. The difference is that the contorted faces, pupil-less eyes, and exaggerated facial expressions have taken on the almost self mocking quality. The horror artist sees horror everywhere and pokes fun at himself in the process. The book itself has some Q&A with the manga artist in between the chapter breaks. It's noted that he draws the cats in this manga in a more realistic fashion where they appear cute, rather than sinister as in his horror manga. 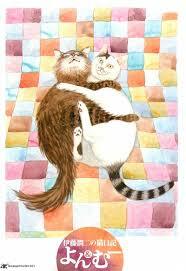 The cats in Cat Diary are dare I say, cute!? As a whole, the book can only be described as absolutely charming. 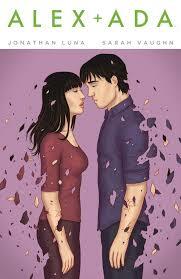 In October the Image Comics series Alex + Ada came to an end. Although I'm terribly sad that this series which I became quite attached to had ended, I'm also glad it didn't have the chance to become uber ridiculous. Fair warning now that I'm going to talk about the ending of the series. So if you haven't read the final volume, which is volume 3, you may wish to skip this article for now. I read this series in a binge. I came into it late and took an interest in it just as the trade came out. I read the first volume and waited patiently for the final two. I had some intention of reading the singles but felt flow of the story was best appreciated in a good binge. When volume 2 was released, it breezed by me and I simply was too busy with too many prior commitments to actually sit down and read it. However this week I decided to binge read the rest of the series. At first, I really didn't know how I felt. I was shocked that volume three moved so swiftly through 25 years. Yes that's right, here's the big spoiler: Alex gets caught and ends up with a 25 year sentence! I was utterly distraught. When I started reading this story, I expected it to go on for a few years to explore all the obvious moral questions that most AI stories are built around. The story did in fact explore a couple of those: Rights for sentient AI and the ramifications, challenges and possibilities of a human/android relationship. That was mostly it. The on-going theme in the story is the distrust of sentient AI. Humans fear that they will be harmed by their creations. Pretty standard really. The more interesting exploration was the reaction of a human female to the thought of having to compete with an un-aging, perfectly looking robot companion. She explains that it's "bad enough to compete with other women, but now they have to compete with things". I mean, its a valid point, if not one that comes from a place which paints women as insecure and woefully concerned about what men think. I was struck by the choice to confront the issue in this way which came from a place of female jealousy and overtly, public emotional reaction rather than anything constructive. It's to this also that you see Alex, our main character and hero, display his unrealistic personality. Alex's reactions to the abhorrent behaviors and opinions of other, can be considered nothing but saintly. In fact, he never does anything to warrant any dislike. He's admirable even in his initial rejection of Ada and again when he steps back to reconsider her sexual advances. You can't really fault him for reconsidering his actions there and the pretty much graceful way he backs out. It's this saintly demeanor and calmness which makes Alex feel very unrealistic. I don't know anyone who reacts to the harsh treatment of others in such a polite and rational way. I mean honestly who has that kind of patience. It all seems more unbelievable then the whole fact AI thing. However, despite this fact, I couldn't stop reading the series. It truly is one of my favorite series of 2014/2015 and I think everyone should read it.